mmm sushi! i haven’t made in it forever and forgot how not hard it is. bring the water to a boil in a pot with a tight fitting lid. meanwhile, rinse the rice in several changes of water until it runs clear. once the water is boiling, add the rice and cook for 5 minutes. reduce to a low simmer and cook for another 15-20 minutes. remove from heat and let sit for 15 minutes. then mix in your vinegar mixture and spread out in a ceramic dish so it cools. let sit covered with a damp cloth until cooled and ready to use. steam the tempeh for 10 minutes. mix everything else together then crumble the tempeh into it. mix it up! if it’s not as creamy as you’d like, add another tbsp vegenaise. toast your nori! if you don’t it will be chewy and hard to cut. turn on a burner and carefully toast each sheet (using tongs). it will start to droop a bit, move it around and don’t let it touch the burner (obvs). it should only take about 15 seconds per piece. if you want to have 2 distinct kinds, i would say do the tempeh, scallion and sesame, and then the veg in the other kind. i liked it all mixed up, and the ones that i put EVERYTHING IN were my fav. take a sheet! lay it out! if you have a bamboo roller then use it. take a handful of rice and spread it as thinly and evenly as you can leaving a bit of space on either end (but spreading all the way to each side edge). lay out your filling on the bottom empty bit (closest to your body). i tend to overfill everything that needs rolling and end up with a big mess but in this case i would encourage you to be generous with your filling. even the craziest ones i thought i was making came out normally sized. carefully roll the bit close to you over, tucking in the edge so you’re trapping the filling. keep rolling, making sure it’s even all the way across, until you reach the end bit, dab with water and roll to seal. put aside and continue until it’s all used up! get a SHARP KNIFE. i mean it! SHARP! and slice your rolls into pieces. 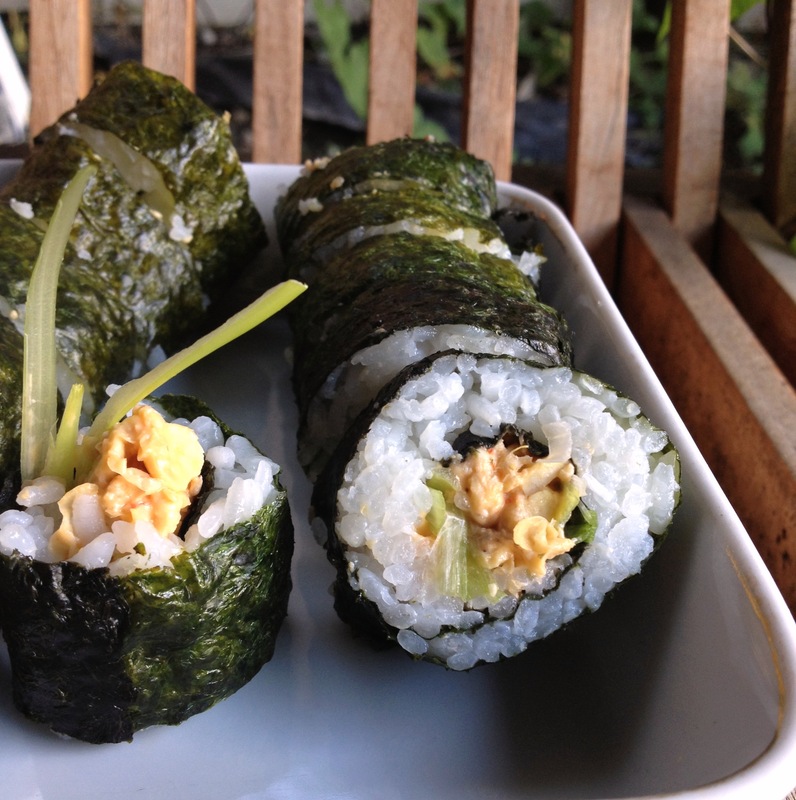 get your soy and wasabe and pickled ginger ready and dig in. NOTE: this kept shockingly well as leftovers. mmmm. 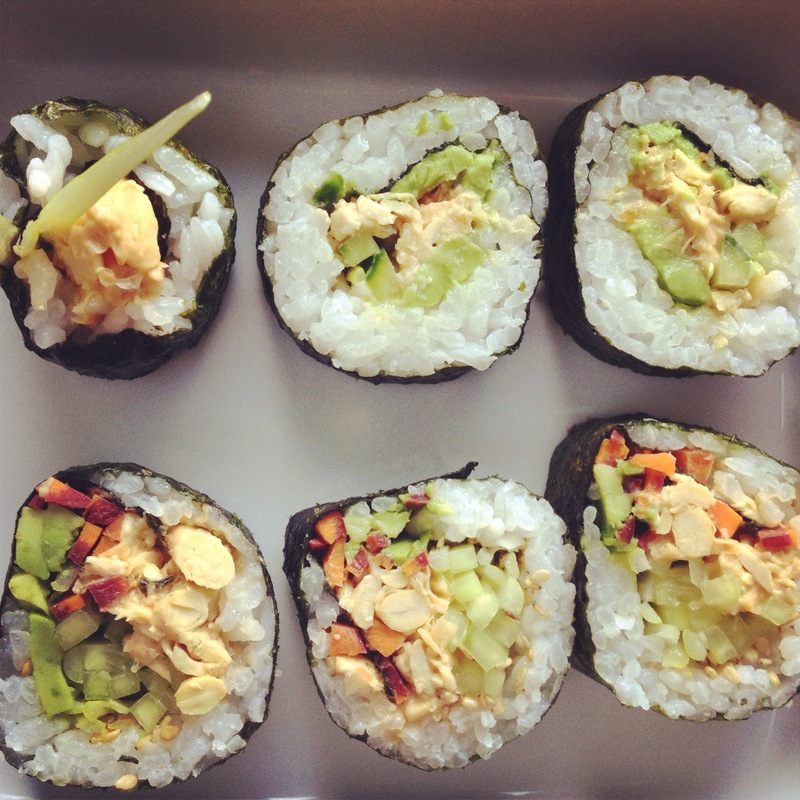 I wish I knew how to make sushi…. This recipe is fantastic! I didn’t have the chili paste so I just used extra vegenaise and siracha to taste, and it came out nice and spicy! perfect solution! glad you liked it! Next PostNew house! No Internet!